Bears love honey, and once they know where a hive is located they will stop at almost nothing to get the honey. They will leave you with no honey and destroy your hive boxes in the process. Bears are increasingly seen in areas inhabited by humans as their habitats are disappearing, and they are usually known to visit apiaries at night. Bears are difficult to deter, but not impossible. Place your hive boxes in an area away from paths traveled by bears. If you believe bears have been journeying near your bee hives, relocate the hives. 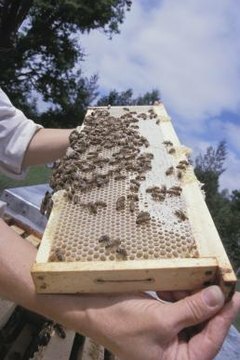 Paint your hive boxes in a neutral color that blends with the environment, making them less noticeable. Keep the surrounding area free of debris, such as excess honey and beeswax. Placing bee hives inside a bear-proof building can keep your hives safe. An existing outbuilding or a structure built specifically for keeping out bears can work. The hive's entrance must be flush with the outside wall, with a hole to the outside in the wall so the bees aren't trapped in the hive. Pieces of wood with nails coming up through them, fastened to the ground in front of doors and windows, can help keep bears out. Bee hives can be placed on a level roof-top to keep them out of the bears' reach. Your hives must be level. Be sure no poles or trees can be climbed to access the roof-top. Remove and put away your ladder after each time you go on the roof. Cover window sills with heavy wire netting to prevent them from being used as footholds. Motion sensitive detectors can help scare bears away from your bee hives. Motion detectors that emit loud noises and flash red lights when movement occurs within their range are available. They work especially well in conjunction with other bear deterrents. A high-voltage electric fence around the perimeter of your apiary is reasonably inexpensive. Place five strands of fencing at heights of 4, 12, 26, 36 and 48 inches. Check the chargers frequently, and keep weeds and grasses trimmed to below the fence level. Bears are large, heavy animals with dense fur, and a minimum of 6,000 volts is required to dissuade them. Caution must be used to protect children and pets from the fencing. Bears are capable of tearing through an electric fence, hardly noticing the shock. To prevent this from happening, bait the fence. Hang bacon strips or pork rinds from the fence wires. When a bear tries to taste the bacon, his sensitive muzzle will receive a nasty shock. This should keep him from coming back. Your Backyard Hive: Any thoughts on protecting the bees and hives from hungry bears? Which Animals Can Get Food from a Hummingbird Feeder? Are Russian Bees Gentle or Aggressive? Do Grizzly Bears Avoid Humans? What Is the Difference Between a Nest & a Hive?